Recyclable, strong, resistant to corrosion – there are plenty of reasons to choose lead for your roof. Macclesfield Roofing has performed leadwork for years as Macclesfield still has a large number of roofs with lead in their structure. Lead can be bossed into all sorts of different shapes as the material is soft enough to allow it. When lead is converted into lead sheet, it has the potential to last for 80-90 years and in some cases it can last more than a century. Part of the appeal of leadwork in roofing is how it handles the varying weather conditions – which is particularly important for the Macclesfield area. When your roof takes a beating from the wind and rain, you’ll be safe in the knowledge that your roof won’t degrade with each passing year and you will be protected from all weather conditions. To develop the point, lead will actually expand or contract as the temperature rises and falls. This is hugely important as it means that the lead will work in concert with your roof as the weather changes – protecting you from unnecassary repairs or damage. 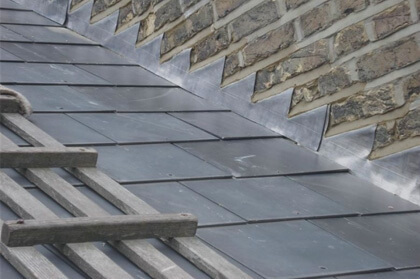 Our expert team at Macclesfield Roofing can use lead in a number of ways including lead flashing, welding, box gutters, valleys and sheeting. Even though leadwork is one of the oldest roofing techniques, new practices are being developed all the time as the roofing industry evolves. In the simplest of terms, you can trust Macclesfield Roofing to have the skills to fix your roof the first time round with our efficient service. Those of you who have been enjoying the benefits of lead roofing will be no stranger to this, but statistics show that lead is an incredibly cost-effective solution over the long term. When you consider the impact of man-made materials in the roofing industry, lead is the most durable by far. It’s also true that lead sheets are recyclable and enjoy a strikingly low carbon footprint, which pleases the environmentally conscious amongst us. Lead roofing is best discussed with an expert, so contact Macclesfield Roofing today on 01625 427 581.